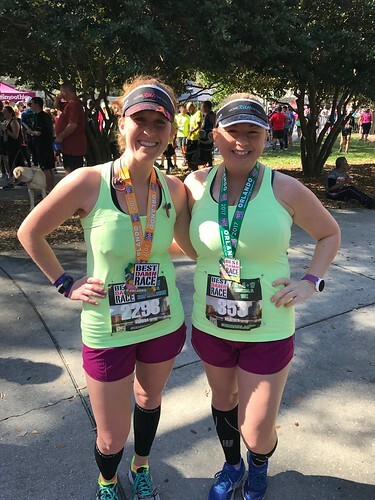 On March 11th, I ran the 40th Gate River Run 15k in Jacksonville, Florida. Greg and I picked up the kids on Friday afternoon and we headed north. 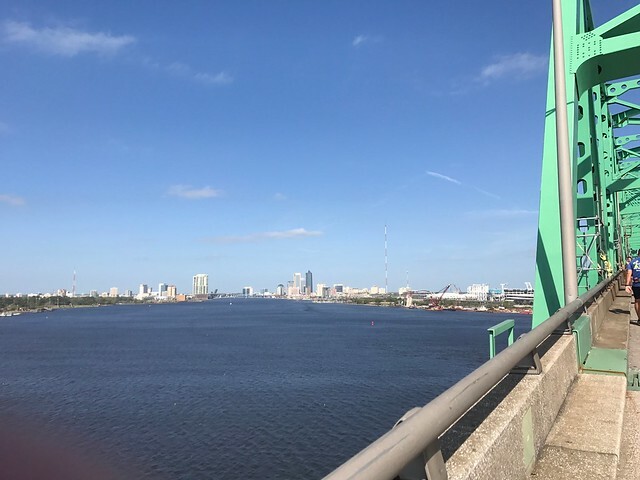 It was our first time in Jacksonville, so I was excited for the kids to stay the night in a hotel and go exploring the next day. 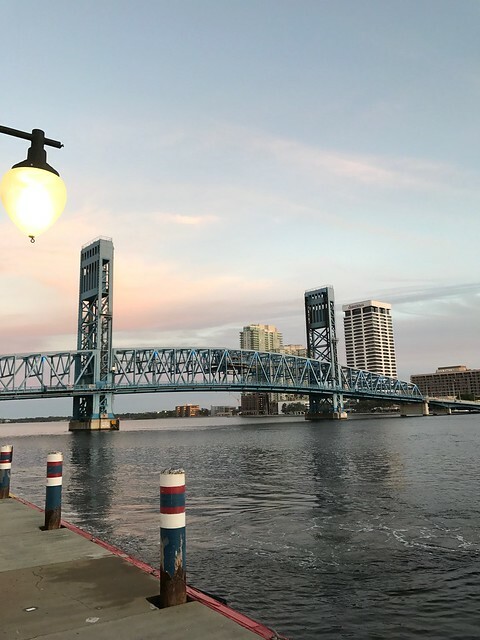 We walked over to Jacksonville Landing on Friday night for dinner with the hopes of watching the IU game, but no such luck. We had a good view of the first bridge I would run the next morning. 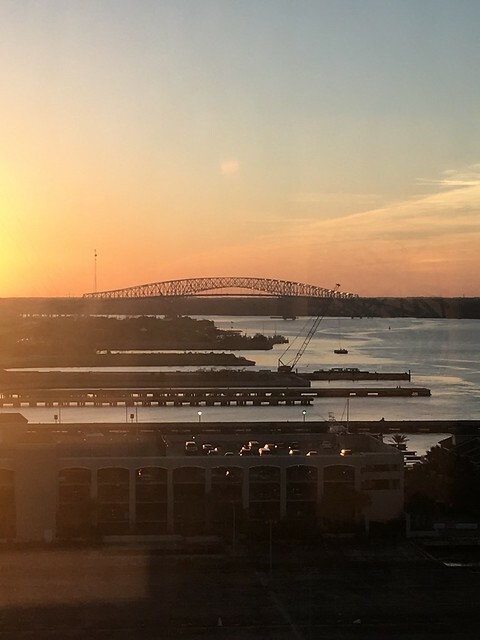 Heather had a good view of the second bridge, the green monster, from her hotel room. Yikes. The race didn’t start until 8:30am, so I was looking forward to getting up a little bit later on Saturday morning, but no such luck again. Crosby was up several times in the night and we all were up at 5am when he woke up throwing up. Not the best way to start the morning. I considered just going home right then and there, but Greg told me I needed to run. I headed out to meet Heather and Nathan to walk to the race around 6:30am. Considering what I had left Greg with in the hotel room, I was incredibly anxious and jittery leading up to the race. 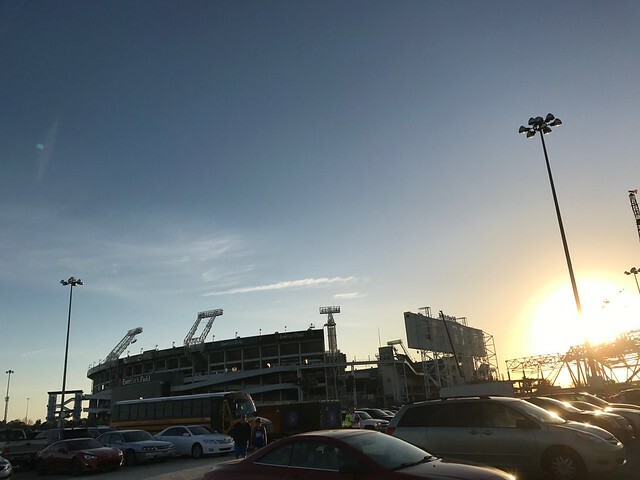 We met up with Juliana at Everbank Field (where the Jacksonville Jaguars play) and waited until it was time to get into our waves. I made a rookie mistake when I signed up for the race and entered the non-seeded division putting me in wave 2. Heather planned on starting with me, but they wouldn’t let her into wave 2 since she was seeded in wave 1. I was bummed, but she ended up waiting to start in wave 2 with me. There was a lot of down time since we got to the race super early. I was bouncing around like crazy, still very anxious and nervous. I didn’t know the city or the race route and I kept texting Greg to see how Crosby was. 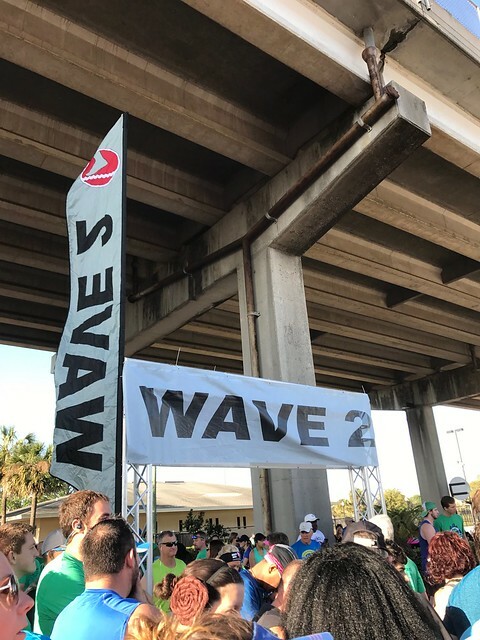 Wave 1 started around 8:30am including the elite runners. The Gate River Run is the largest 15k in the nation so there were tons of professional runners running the race, which was really cool to witness. Wave 2 moved up and we were ready to start. Our first mile was really fast (8:27) but I knew we would slow down a bit moving into the first bridge right after the first mile. I slowly ran up the bridge being careful on the grates of the bridge. 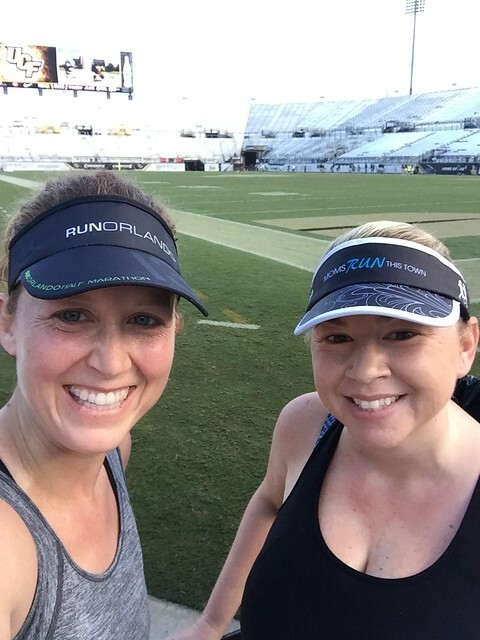 We continued on our way and had a solid first 5k before we slowed it down again. The weather was really great when we started but it quickly warmed up. 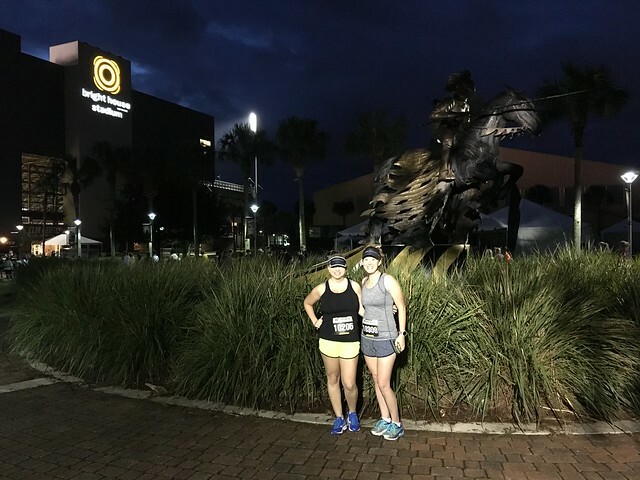 The middle of the race was really great as we ran through the neighborhoods in Jacksonville. The houses were gorgeous and the spectators were awesome. Each neighborhood had their own little block party. The spectators were having more fun than the runners. They were tossing donut holes to the runners and were offering Jell-o shots, beer, mimosas, and food as we passed. Before heading to the second bridge, several spectators were spraying the runners with a hose. Just after mile 7.5, we headed up towards the green monster. My legs were hurting, but the bridge was so steep that it almost felt better to jog up rather than walk. We found Juliana again while we were towards the top of the bridge, so the three of us made our way down towards the finish. The bridge was just as steep coming down and there was a lot of turns since we were coming down the ramp. 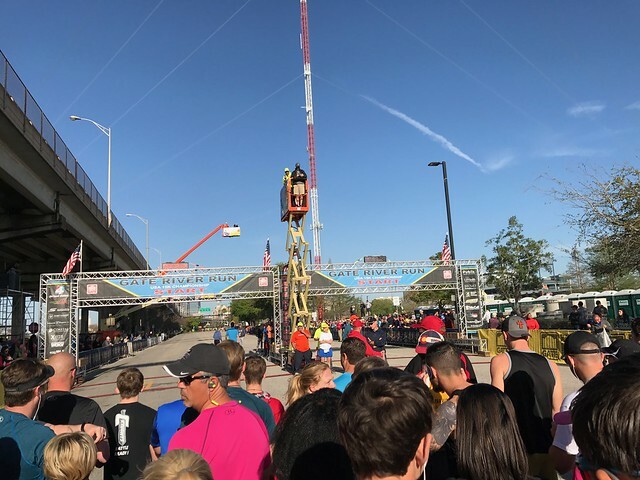 We had to wind around the stadium to get to the finish. About .2 miles away from the finish, Heather tripped and fell. It was so scary. The road was packed so as I bent down to help her, Juliana immediately started blocking people from running into us. Another nice gentleman stopped to make sure she was also ok. She was able to get up and finish, thankfully, but she was bleeding from her knees and hands. After all of that, I finished with a 1:39:47 which was a PR! It wasn’t the finish I was hoping for, but I’ll take it. The end of the race was insane. There were people everywhere and the area around the finish line was so small and tight. We met up with Nathan and Heather headed to the medical tent to get cleaned up. We all skipped the after party, which looked just as insane, and I headed back to the hotel to check on everyone. Overall, the race is a really good race, but I wish I was able to enjoy it more. I was worried about Crosby the entire time and then worried about Heather after the race was over. We had hoped to explore St. Augustine on the way home, but Crosby got sick the entire morning, so home we went. Both kids napped the whole way home. By that night, I was so physically, mentally, and emotionally exhausted. It was a long 24 hours. I’m not sure I’ll be back to Jacksonville for the Gate River Run anytime soon, but maybe eventually? 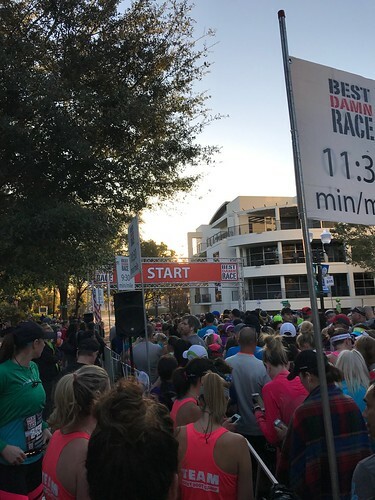 On Saturday I ran the Best Damn Race half marathon downtown. 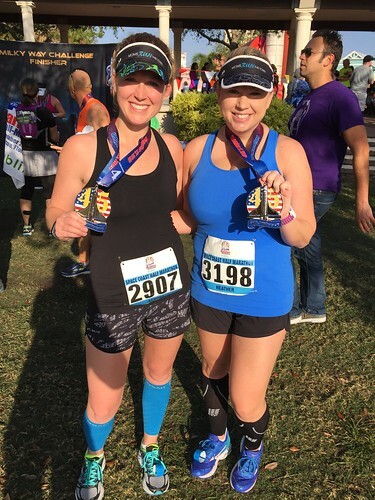 This was my third time running a Best Damn Race, but my first time running the half marathon. My last two BDR races were the 10k in 2015 and 2016. Both of those races resulted in a 10k PR so I was pretty fond of the BDR race. However, I wanted to do something different this year. The race started at 7:25am, which is later than normal, but it was nice to have the sun up at the start of the race. It was chilly and I even considered wearing my long sleeve shirt, but I am so happy I didn’t. 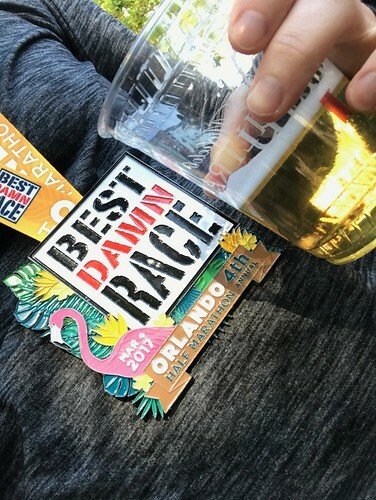 The weather was great, but I was definitely hot during the race. The race started and we were off. 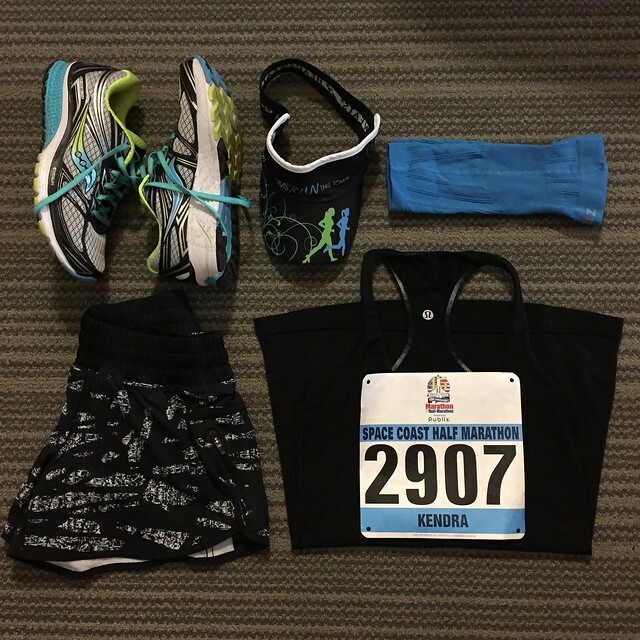 Leading up to the race, I hadn’t thought much about my race goals, other than to finish. I wasn’t too concerned about my projected finish time. When Michelle started having issues with her music, I decided to stop with her so she could get it figured out. Even with the quick stop, we still had a 9:59 first mile. I immediately thought about keeping each mile under 10 minutes, but tried to push those thoughts out of my head. We were moving fast for the first half of the race. 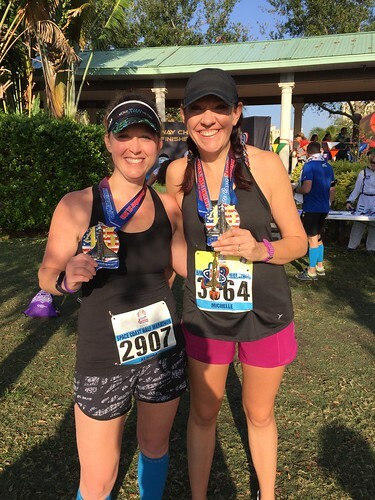 Each mile was well under 10 minutes, two of which were even under 9 minutes – 8:56 and 8:59! I was feeling it. I knew I started off way too fast and I told myself I wouldn’t be able to keep that pace for the whole race. My mind started to get in the way. At the mile 7 water stop, I got some water and went to the potty. It was a good excuse to let Michelle go ahead of me so I could slow down a bit. I did slow down and I started taking more walk breaks than I care to admit. I walked through the water stops and took an extra walk break here and there between miles 8 and 13.1. After crushing the first seven miles, the next six were between 10 and 11 minutes each mile. It also didn’t help that the last half of the race had a lot more cobblestone than the first half. 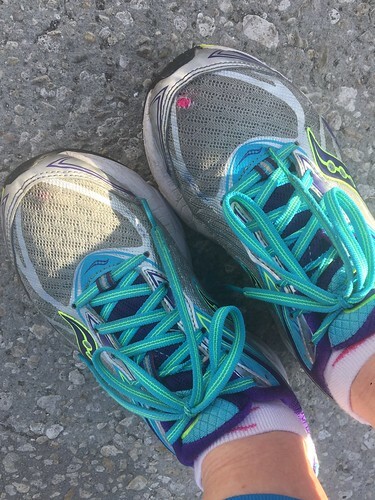 My feet and legs were taking a beating so when my mind was telling me that I couldn’t do it, or to slow down or walk, I listened. I knew Greg and the kids were heading downtown so that is what I focused my energy on after mile 12. 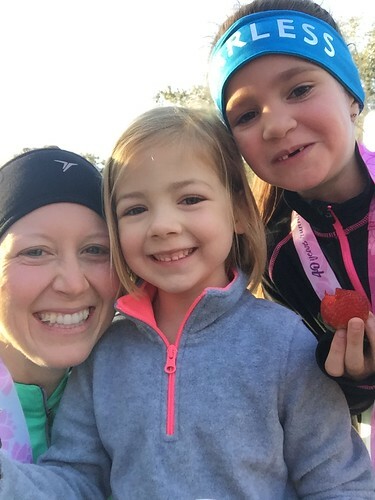 I thought about trying to come in under 2 hours and 10 minutes, but once I saw them, I stopped to say hello and give kisses before heading to the finish. The kids cheered “go Mommy go!” as I ran off, which completely melted my heart. I crossed the finish line and my watch clocked me at 2 hours and 11 minutes exactly. My chip time was 2:10.55. 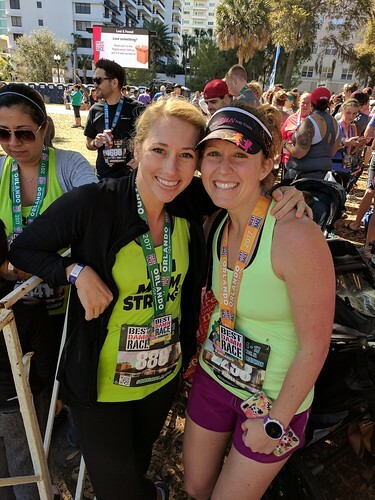 Based on time alone, this was my second best half marathon. But taking into account all other factors of the race, I am disappointed in myself. 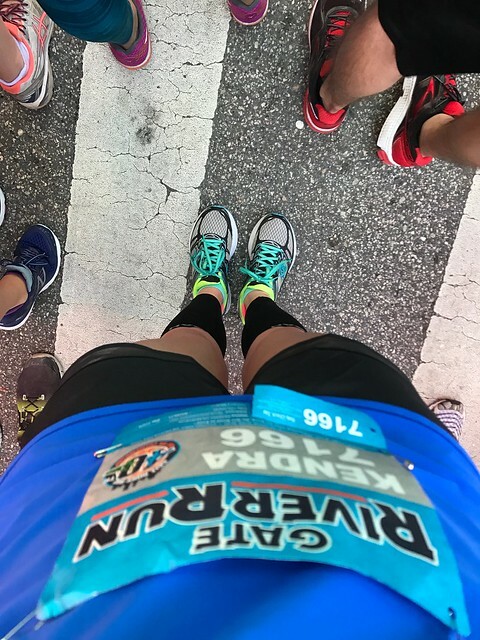 I have (over)analyzed everything about this race and have come to the conclusion that I started out too fast but that I could have continued at that pace. I am fully capable of doing it, but the mental struggle was real. I usually can push past it and just focus on finishing the race, but this time was different. I am still super stoked with my time, but can’t help to think about what it would have been if I didn’t stop to walk a few of those times. 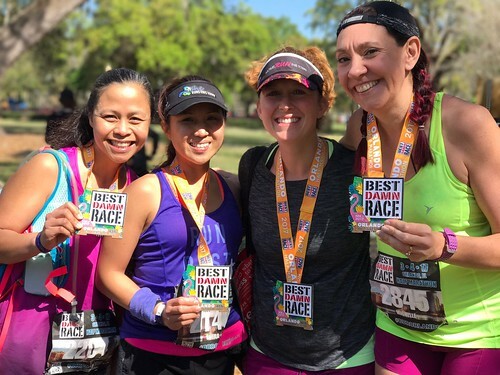 The Best Damn Race is a really well organized race and a fun one at that. One thing I didn’t like about the race was the course route. There were way too many brick roads and I have officially sworn off ever running downtown again. One thing I loved about the race was the after party. It was so fun to have a drink and chat with so many people! 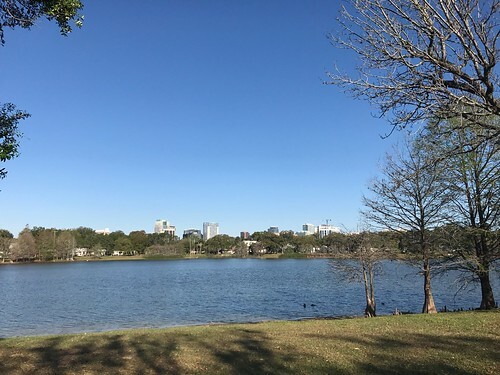 The kids played at the park then we walked around Lake Eola before heading to lunch. It was such a fun morning. It was so good to see so many familiar faces at the race. 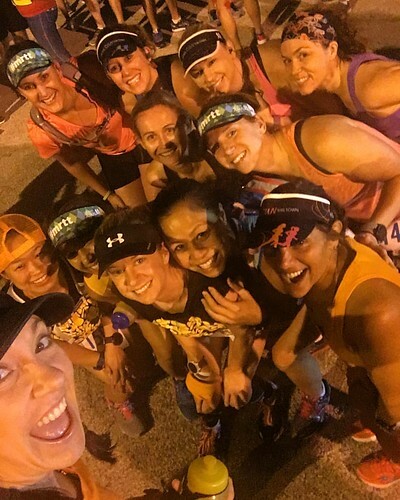 I sure do love this little running community here in Orlando. 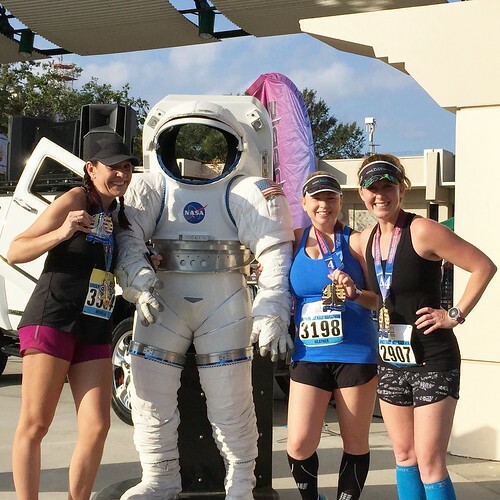 The second race in my double race weekend last month was the Celebration half marathon in Celebration, Florida. 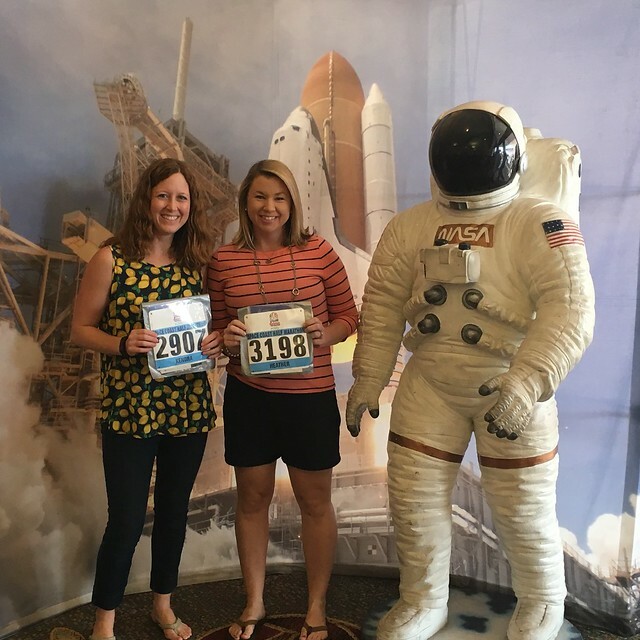 This was my third time running this race so I knew what to expect going into Sunday’s race. I was really looking forward to the post-race festivities. What I did not expect was the cold and rainy forecast. 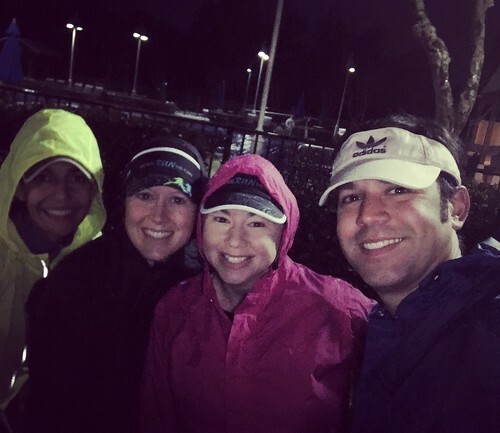 Thankfully, Heather picked us up a lightweight rain jacket to wear during the race, but I wasn’t thrilled about the idea of running 13.1 miles in a rain jacket. Once we got to Celebration, we sat in the car for as long as possible before heading to the start line. As we got out of the car, I knew the rain jacket was the only option. The race was underway and we were off. Heather and I were focused during most of the race and didn’t talk much. The first six miles were really great and we averaged around 9:45 minutes per mile. Between miles 7 and 9, we hit the wooden boardwalks on the course. I knew these miles would be slower especially since the boardwalks were wet. My only concern at that point was to not fall. The rest of the miles were around 10:30 minutes per mile with exception of mile 12 which was our slowest mile. 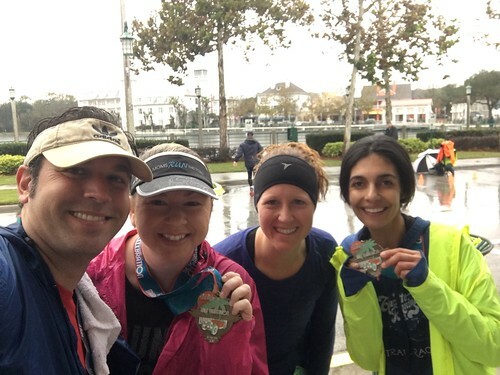 Throughout the race, we ran through a nice little drizzle, but towards the end of the race, it was really raining. I was definitely ready to be done by that point and so did Heather. I kept encouraging Heather to keep running and to not walk. For the last half of a mile, we could see the finish line from the other side of the lake, but we were still so far away. Our official time was 2:14.30 which was a PR for Heather! As soon as we finished, I put on my fleece pants and changed into a dry shirt. We headed over to the after party for some good food and drinks! It did not disappoint, but it was short lived because the rain continued to fall and we were all freezing. I think that I shivered for a good two hours after the race. Aside from the rain, it was a great race and a great double race weekend! 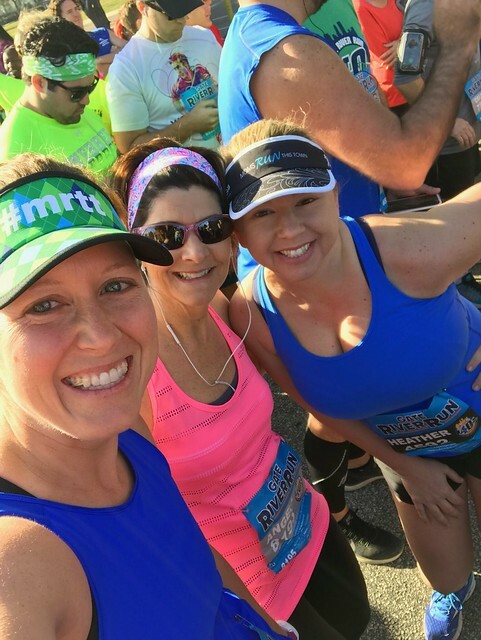 My double race weekend started with one of my favorite races, the Lady Track Shack 5k. 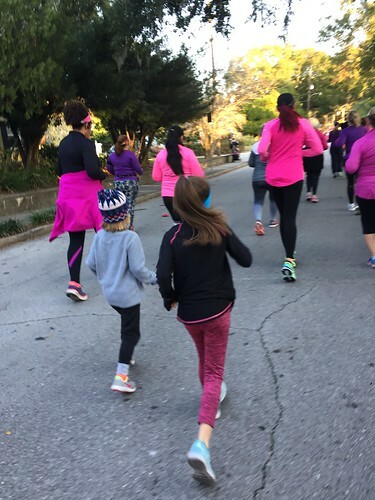 This year was even more special because Kenley came with me to run the race. I told her a couple months ago that we were going to run an all girl race so naturally she has been talking about it ever since. She even would tell Greg and Crosby that they couldn’t go because it was only for girls. The night before the race, she got up at least twice asking if it was time to get up yet. She was so excited! 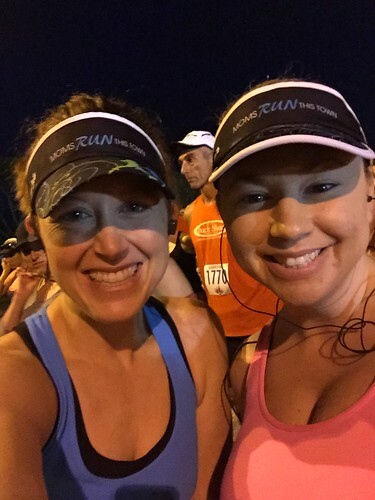 We left before the sun came up and headed down to Loch Haven Park to meet up with some friends before the start of the race. Kenley was excited to see Livie, Michelle’s daughter, was there. 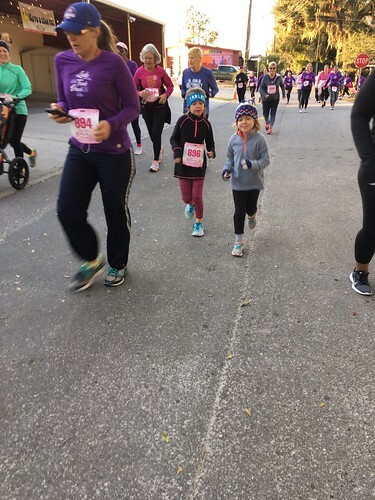 This was my first time ever running a race with a stroller and it will likely be my last. We had to start at the very back of the race, the very back. The whole first half of the race was spent bobbing in and out of the walkers trying to actually run the race, all while trying my hardest not to run into anyone with the stroller. Kenley asked the whole first mile if she could get out and run with the girls. Just after the first mile, when it opened up just a bit, she hopped out and was on her way. She was good about getting back in the stroller when she needed a break. I had to tell her a few times to slow down and to make sure she stayed next to Livie so she could pace herself. As we passed Track Shack, the DJ said into the microphone that she must be the youngest runner on the course. She hopped in and out a few more times and cheered Livie on from the stroller while she was resting. The last quarter of a mile, I pushed her to run the rest of the race. We kept telling the girls that the donuts were waiting for us at the finish line, which they were, Krispy Kreme! We finished in 39:23 based on our chip. You can see that we crossed the start line a good three minutes after the clock started since we were in the very back. 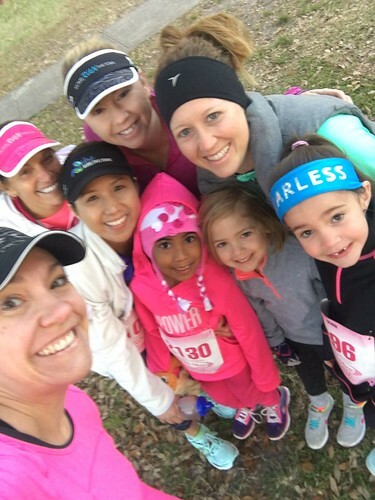 We had such a good time and saw so many other mamas after the race. 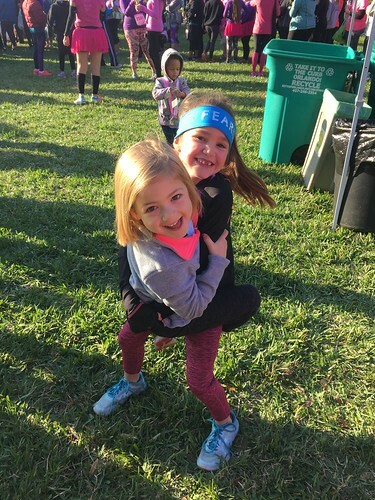 Kenley had a blast playing with Livie, who ended up placing third in her age group! Kenley is already talking about running the whole race next year. 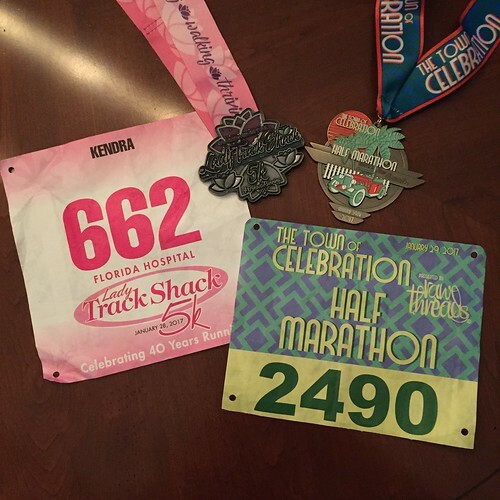 You can also see my past race recaps for the Lady Track Shack 5K from 2015 and 2016. 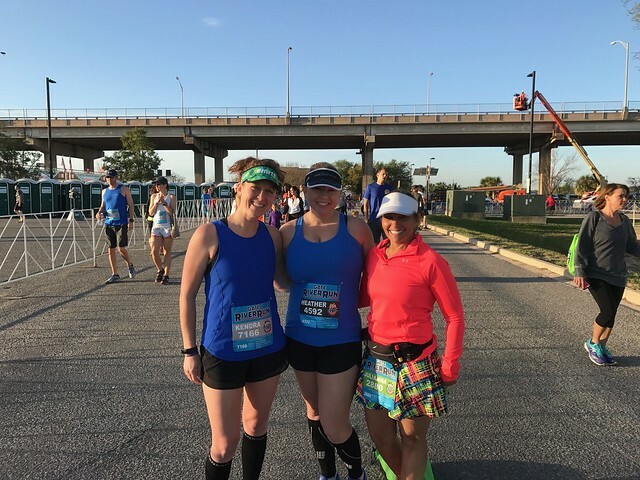 My first half marathon of the race season was on Saturday, October 30th. 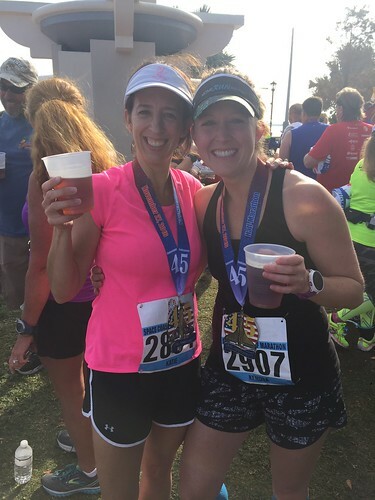 It was my first time running the Lighthouse Loop Half Marathon, so it was a great way to end a very busy month of October for us. 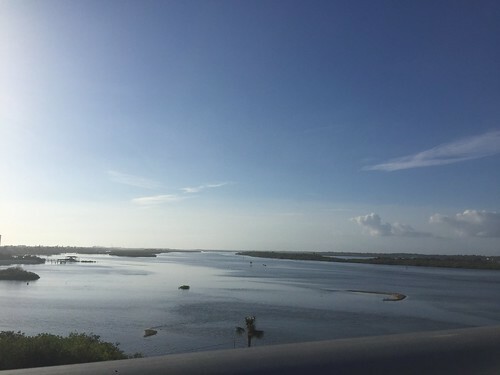 The race started in Port Orange which is just over an hour away from east Orlando. The race wasn’t scheduled to start until 7:00am which meant my alarm was set for 4:00am. 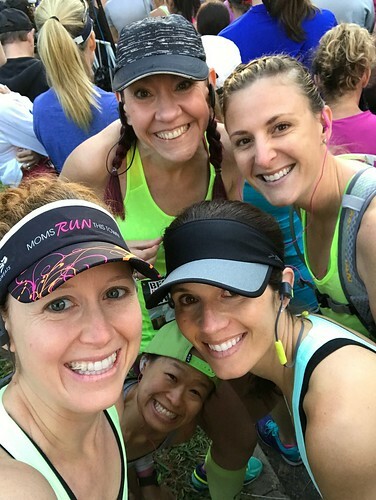 I carpooled over with some other running mamas from the area and we arrived around 6:15am, which was enough time to go to the potty, stretch, take some selfies, and head to the start line. Leading up to the race, I didn’t do a whole lot of mental preparation which is normal for me. I know I’ve logged the miles so I typically just go out there and run. However, I was preparing for a hot and humid day, which was a bummer considering we had amazing weather the weekend before. 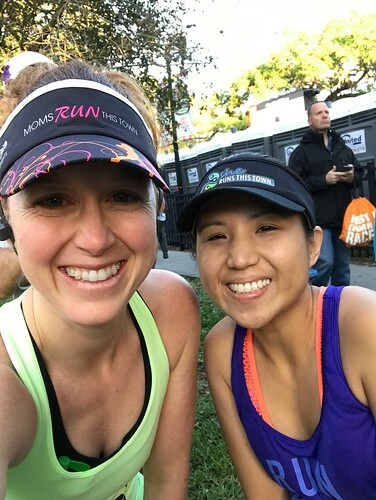 I got the normal pre-race jitters, but nothing crazy, mostly because I had never been to the area so I wasn’t familiar with where the race started and ended. 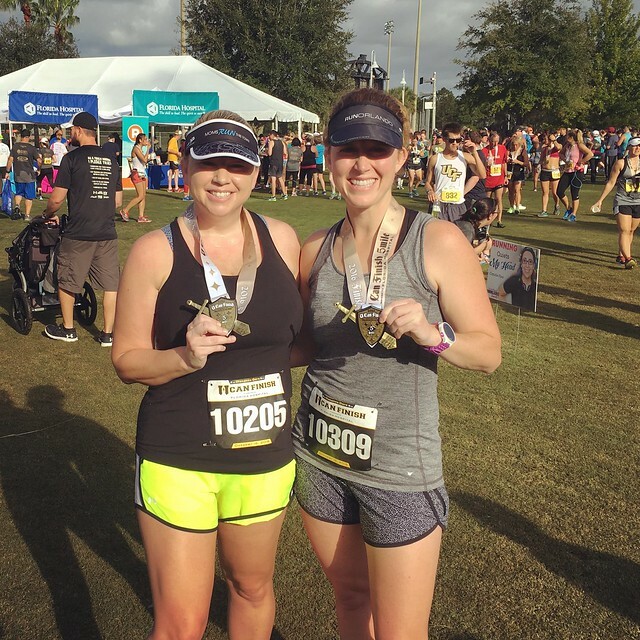 Thankfully, I was with a lot of other mamas who had ran the race before. The race started and we were off. We planned to walk through the water stops to get water at every stop since it was so hot. I also brought a water bottle with Cocogo in case I needed something more than water. 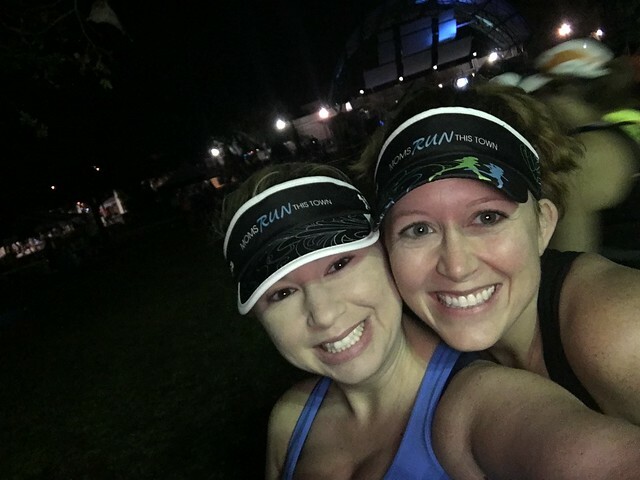 Our first three miles were solid — 9:54; 9:59; 10:10 — but once I saw mile 4 was 10:28, I was annoyed. Based on my own reaction, I knew today could be a good race day, so I kicked it into gear. Miles 5 through 9 were between 9:44 and 10:05 and I was feeling pretty good. 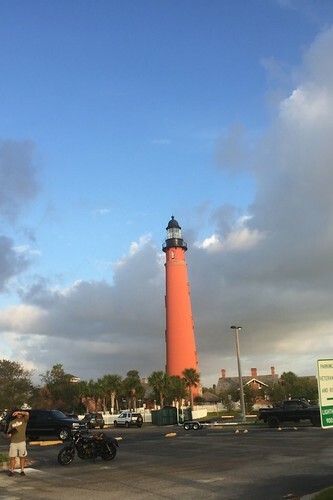 The course took us down the Ponce Inlet until we were forced to turn around and run back up. We made a loop around the lighthouse around mile 6 or 7, which was pretty anticlimactic at the time, but looking back it was pretty cool. 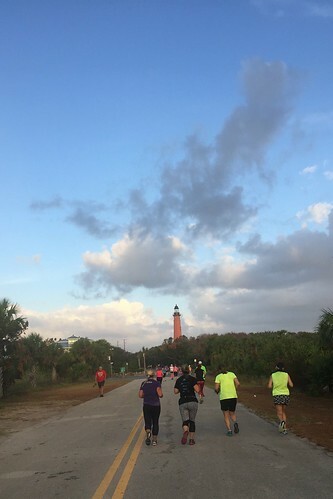 I should have brushed up on the history of the lighthouse before running the race and I may have appreciated it more. Around mile 10, I started to slow down a little bit. The sun was blazing down on my back and there was very little shade coming back up the inlet. It was hot and my feet hurt. I could tell my walks through the water stops were getting a little bit longer. 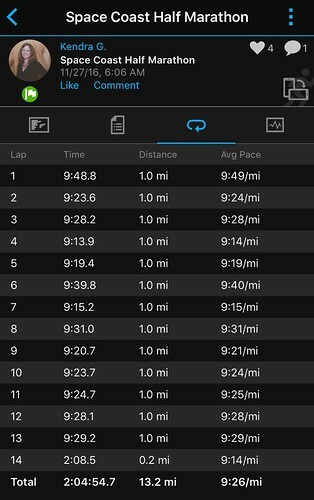 Miles 10 and 11 were 10:17 and 10:32 and I just couldn’t help it. It’s always around this time that I start to think about my projected finish time. 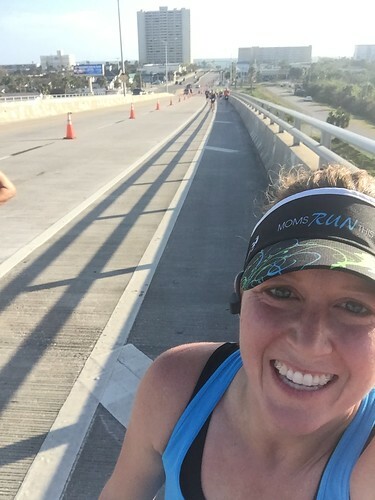 I knew it could be a personal record (PR) for me, but I couldn’t help to think about what was coming for me at mile 12… the bridge. I started to get anxious and short of breath (even more than I already was) so I forced myself to not think about it. 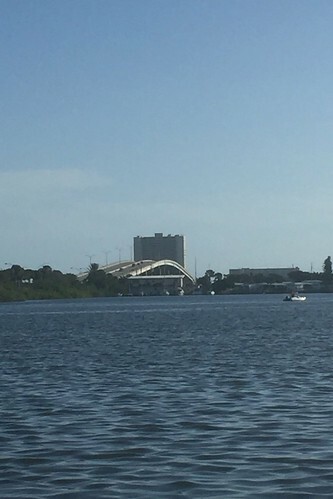 After making my way back up the inlet, I turned the corner from the flat road and there it was…the bridge. I slowed down on the way up the bridge and even walked a little bit. I forced myself to not look at my watch. 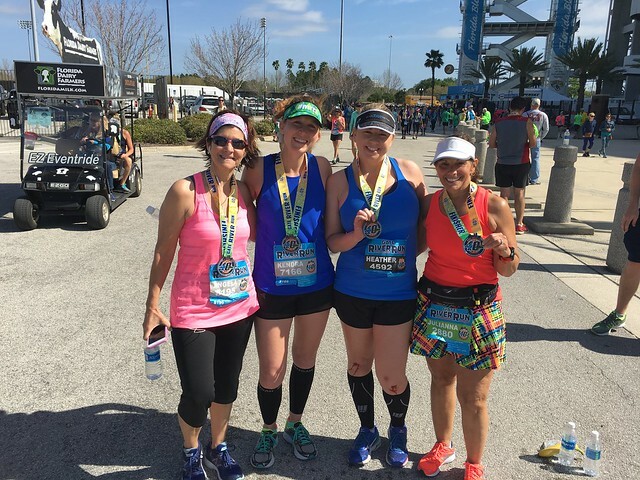 I knew if I started to think about my finish time then I would start to get anxious again and all I really cared about at that point was making it over the bridge, and then to the finish. Miles 12 and 13 were 10:31 and 10:25 and I was able to pick it up for the last .1 miles of the race. Thankfully, I saw Jaime who had already finished, she yelled at me that the finish was just around the corner so I busted it. I came in with a finish time of 2:13.19 which was my fastest half marathon yet. 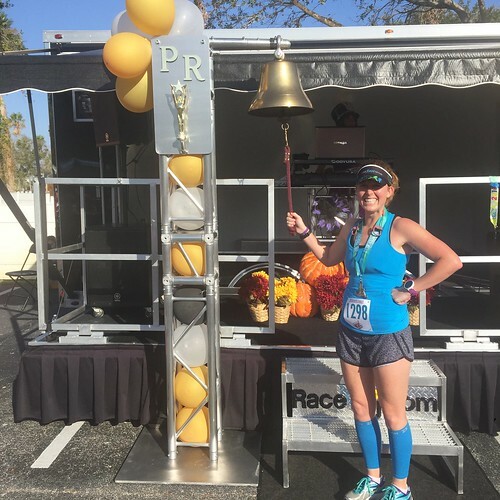 I went back out to watch Heather and a few other moms finish before I made my way over to ring the PR bell and get my much-deserved beer(s). 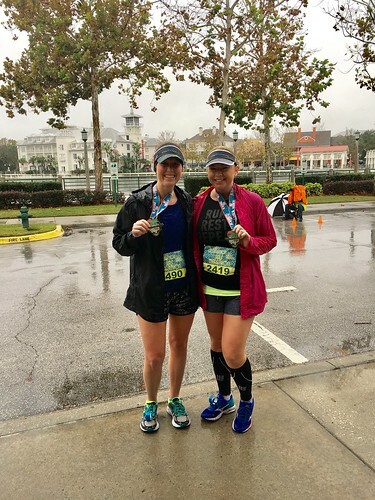 Despite the weather, it was a really good race and I couldn’t have been more pleased with the outcome, especially considering the steep bridge at the end which slowed me way down. 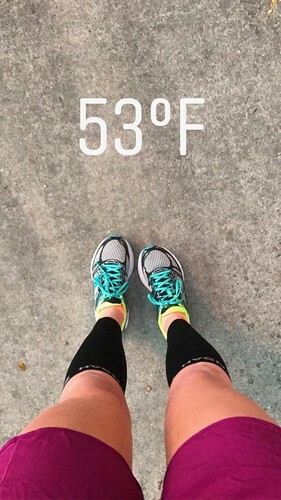 I wasn’t expecting a PR for this race, but I am happy with the progress I’ve been making and now looking forward to breaking it again next month at Space Coast where I know there are no bridges! Now, on to the next race and a new pair of shoes! The U Can Finish 2 Mile and 5 Mile races were on Sunday, October 16th. 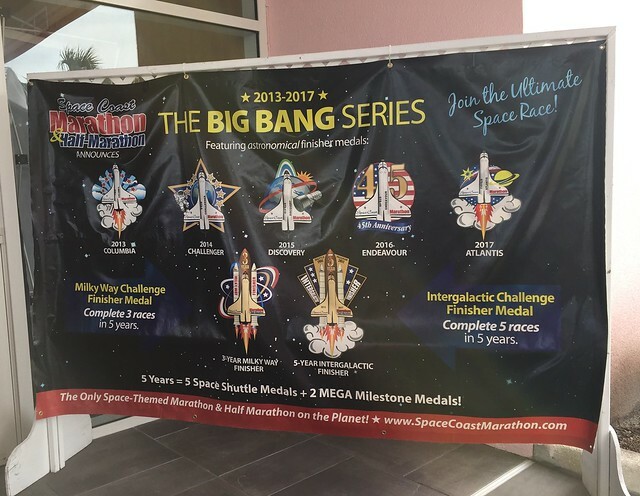 If you want to complete the Distance Dare, you run both races. This is my third time running this race and it gets better each time! 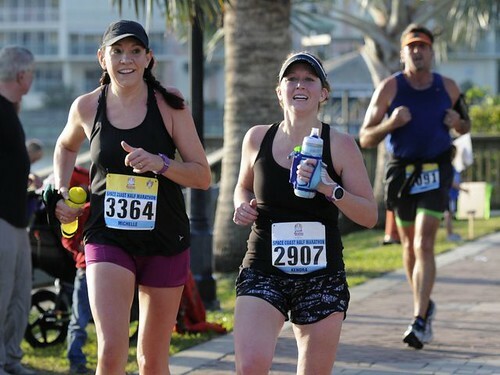 The timing of the race has always been great as I have worked the 7 miles into my training schedule for any upcoming half marathons. It’s also another fun thing to add to our favorite month of October! 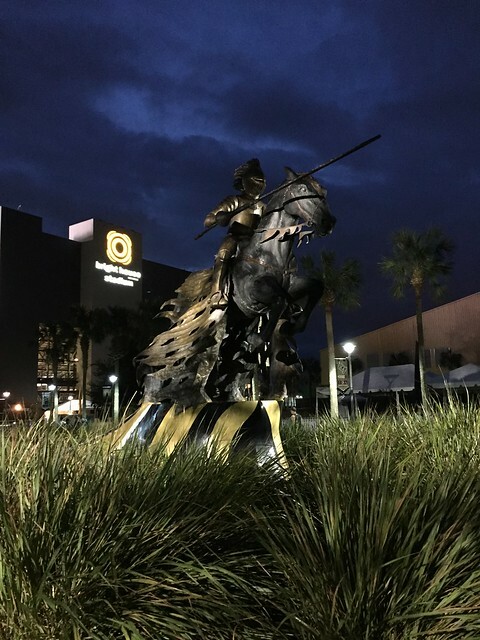 The race is on the UCF campus and starts right outside the football stadium. The 2 mile race was first and at the end, we got to run through the stadium. 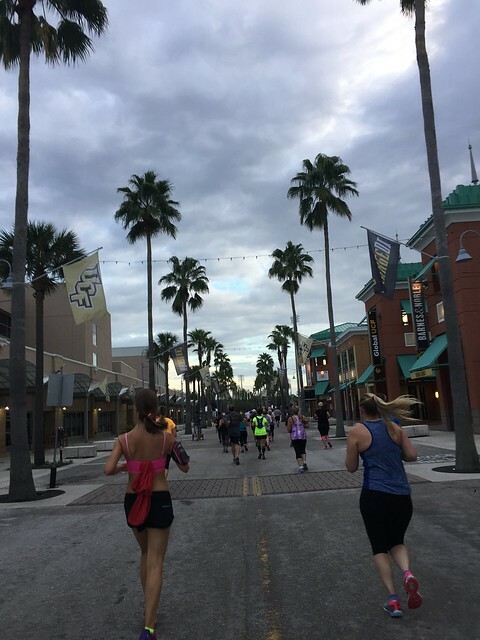 All of the UCF Athletics teams were there cheering on the runners and this year the race happened to fall at the end of Homecoming week. The 2 mile race was great and we ran it in 20:49. We didn’t have a ton of time before the five mile started, so we grabbed a little bit of water and headed back to the start line for our second race. Just after mile 2 in the 5 mile race, Heather wasn’t feeling great, so we decided to walk and talk. We ran and walked the next 3 miles while we were talking. The goal for the day was to get in 7 miles, not necessarily at any specific pace. We finished the 5 mile race in 60:41 which is definitely not our best time, but we finished, and that’s all that matters! 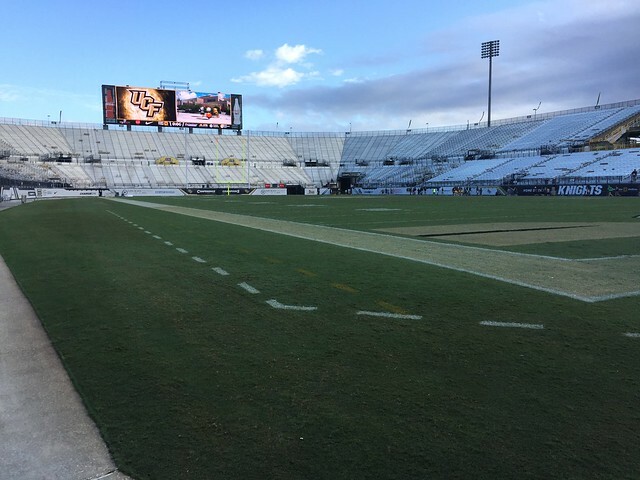 It was really fun running through the football stadium (twice) and the baseball stadium. We also got to see some other people we knew out on the course. Overall, it was a fun race! I’m not sure if I will do it again next year. I may take a year off from this one and find a new race to run. Thanks Orlando Track Shack for another fun race and Go Knights!